On a good day, you can drive to Santa Barbara from Los Angeles in a couple of hours. But on a really good day recently, Santa Barbara came to Los Angeles, making the drive unnecessary. Better yet, the entourage of growers, winemakers, hotel people and area boosters came well equipped with food and wine for a Santa Barbara style dinner. The setting was similar to what you might find where they live--the pool terrace at Shutters on the Beach in Santa Monica, overlooking the ocean that both cities share. A roaring fire and heaters kept the chill away, a young moon sparkled overhead, and an immense span of white tablecloth--it was a really long table-- gleamed right back. The idea was to show off what Santa Barbara contributes to our daily fare, as if we didn't already know. Chef Brian Parks of Coast Restaurant and Bar in the Canary Hotel (Shutters' sister hotel in Santa Barbara) came down to cook. And 98% of what he worked with was sourced in Santa Barbara County, from hydroponically grown baby lettuce to cultured abalone and grassfed beef. For the first course, Parks wrapped spot prawns in thin slices of abalone (above) and placed them on jellied vegetable consomme with micro greens. The two wines poured with this course were Jorian Hill 2007 Viognier and Municipal Winemakers 2009 Bright White, which is a Riesling from Kick On Ranch in Los Alamos. That's Municipal's Dave Potter toasting with it at right. An entire head of baby romaine arrived next, unadorned except for a creamy herb and Parmesan dressing. Grilled sea bass with blooming arugula, fennel and tangerine segments provided a chance to decide what wine goes best with fish, red or white. Frank Ostini of The Hitching Post, whose restaurant and wine were immortalized in the film "Sideways," provided the red, the 2006 Hitching Post Pinot Noir from the Cargasacchi Vineyard. Doug Margerum of the Wine Cask and Margerum Wine Company contributed the white, a Cimarone 2009 Sauvignon Blanc from Happy Canyon, the newest AVA (American Viticultural Area) in Santa Barbara County. Roasted grassfed sirloin, accompanied by Bloomsdale spinach, Nantes carrots and spring garlic soubise, arrived after nightfall, but you didn't need light to appreciate the quality of the meat. The wines were Jorian Hill's 2007 Syrah and Margerum's Piocho 2007, a Bordeaux blend from Happy Canyon Vineyards. Our Daily Bread Bakery in Santa Barbara supplied the makings of a bread pudding that was divided into thirds. One portion was accompanied by bourbon blueberries, another by brandied cherries, and the third by strawberries with chocolate. Frank Ostini brought a wine sweet as honey to go with the dessert, the Hitching Post 2007 Late Harvest Gewurztraminer. And Municipal Winemakers provided its 2009 Sweetness, which is another Kick On Riesling and as perfectly named a dessert wine as you can find. It was a night when the food purveyors were in the spotlight. A couple of them, Driscoll's Berries and Coleman Family Farm, distribute in the Los Angeles area--Coleman at the Santa Monica Farmers Market. Others sell at farmers markets in and around Santa Barbara. including Shepherd Farms, Murray Family Farm, BD Farms and Rancho San Julian Beef. Still more were Kanaloa Seafood Company, The Cultured Abalone, Scarborough Farms, Westland Produce, Rieger Farms and Global Gardens, names worth checking into when you make that two-hour drive north. 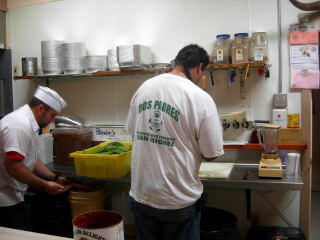 The dos padres (two fathers) who run Dos Padres Mexican Restaurant in San Miguel are brothers as well as fathers. Tomas and Evodio Martinez are from Acambay in the northen part of the state of Mexico. Their restaurant is an out-of-the way gem with delicious homestyle Mexican food. My friend and I found it while driving around quiet, country-like San Miguel looking for a place to have lunch. We had come from Paso Robles to visit the nearby mission and to shop. The Martinezes don’t advertise, and they don’t have a website. Word of mouth brings in plenty of customers. As a matter of fact, they’re doing so well they are opening a second Dos Padres in King City this summer. The restaurant is small, just nine tables. “Tell me what to have, a really good dish,” I ask the waitress, who is Maria, Evodio’s wife. Chiles rellenos, she suggests. And then she talks up “killer” chile verde. That, of course, is what I order, a bowlful of pork in green chile sauce topped with melted yellow cheese and accompanied by tortillas. Yes, it is good chile verde. The pork is cooked separately, then simmered in tomatillo sauce that contains a dash of hot green chile. It is very tender. Not hot enough? To fire it up, there is super hot roasted red chile and garlic salsa on the table. The two other salsas are pico de gallo (chopped tomato, onion, serrano chile and cilantro) and a mild tomato sauce with green chiles. Behind the counter, Evodio Martinez is busy slicing off the spines from a crateful of nopal cactus. But that’s for home, Maria says, some delicious dish in the making for padres, madres (mothers) and their hijos (children). 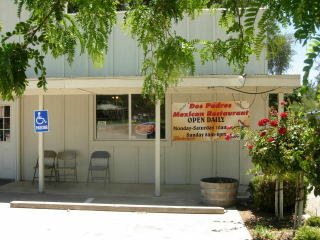 Dos Padres Mexican Restaurant, 340 14th Street, San Miguel, CA 93451. Tel: (805) 467-0033. Open daily 10 a.m. to 9 p.m.